In the most recent edition of Teach Primary magazine, you’ll fine a new article by Rob Webster and Peter Blatchford – Unlocking the potential of TAs. Webster and Blatchford note the change in TA circumstances since last year, when the media reported job cuts, to a more positive outlook in recent months. The article details the Education Endowment Foundation funded project, which provided evidence that TAs improve children’s academic results. The article emphasises the need to rethink the deployment/preparedness of TAs and how various strategies can get the best out of them. Your TA Ofsted Experience – Win a Teaching Assistant Survival Kit! Very little is known about how Teaching Assistants, Learning Support Assistants and nursery nurses experience Ofsted inspections. We would like to give voice to your experiences – good and bad. We’d like to use your experiences to put together a blog for TA Focus and the Guardian’s Teacher Network blog. What happened once the Inspectors had given their verdict. This is an anonymous survey, so you can be as open and honest as you like. Your response is totally confidential. Any use of the data will not identify individuals or schools. 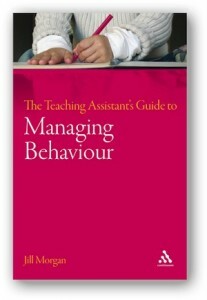 Maximising the Impact of Teaching Assistants by Anthony Russell, Rob Webster and Peter Blanchford. To enter the prize draw, you must enter your email address at the end of the survey (if you don’t want to enter, simply leave this box blank). 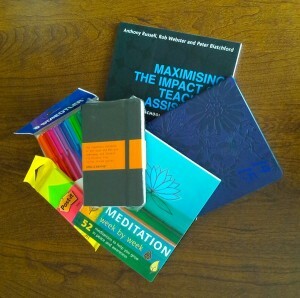 Once notified by us, the winner will need to provide a UK address to receive the prize. 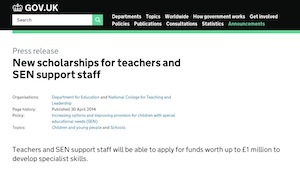 Every year, SEN support staff and teachers are encouraged to apply for the National Scholarship Fund for any specialist training. Applicants have a small timeframe to apply, as the closing date is just four weeks away. The £1 million fund is available for training and applications must be submitted online. Successful candidates will be notified in August 2014. If you are thinking of applying, please read through the National Scholarship Fund for Teachers – Special Educational Needs and Disabilities (round four) PDF document. 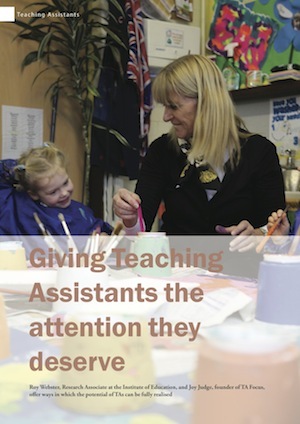 The Maximising the Impact of Teaching Assistants (MITA) programme aims to help schools get the best out of their Teaching Assistants through better preparation and deployment. The next MITA programme, run by a team of experienced researchers, will be held at the Institute of Education (IOE) on Tuesday 7th October 2014. In the spring 2014 edition of Supporting Learning (the National Association of School Teaching Assistants’ magazine), you’ll find an article written by Rob Webster and me (well, mostly Rob). The article follows on from Rob’s article A Quiet Revolution and details the effective deployment of Teaching Assistants in schools. Alex Cunningham, Labour MP for Stockton North, recently led a debate in Westminster Hall on the value of Teaching Assistants in schools. Ask any parent or teacher the value of education, and they will confirm without hesitation the importance of giving children the best start in life and opening the doors to opportunities that will allow, and indeed encourage, them to succeed. To realise this goal, we need not only to provide an education for our children, but to ensure that young people are taught well. And it is in facilitating this outcome that Teaching Assistants most clearly demonstrate their importance to our schooling system. Rather than being the high-cost and low-return intervention many have derided them as being, Teaching Assistants add tremendous value to classrooms and hold a huge potential to improve and enrich educational outcomes. And this is why the 2003 Workload Agreement in England and Wales – an effort of the last Labour government to recognise this potential and to raise standards in schools – significantly increased the number of Teaching Assistants, who now make up around 27.5% of the total school workforce in England, with more than 359,000 in classrooms across England alone. The aim of the Agreement was simple: to allow teachers to actually teach by lessening pressures and reducing burdens elsewhere. Yet, despite the promise and potential Teaching Assistants provide, these valuable assets are undervalued and often underpaid, while their contributions go largely unrecognised. 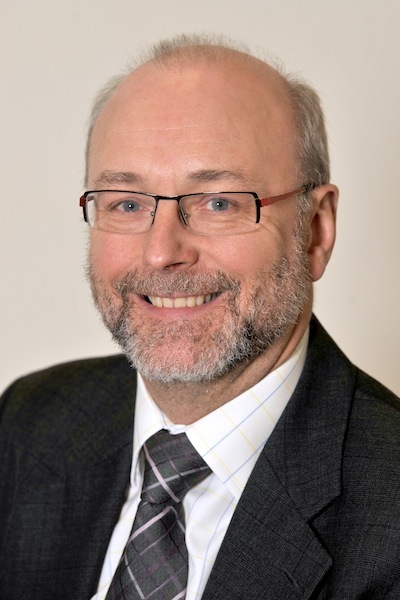 While the need for great teachers at all levels is self-evident, a report from Reform in 2010 took this requirement further – and much too far, I would argue – by suggesting that Ministers “[r]emove the various Government interventions into the cost and size of the teaching workforce” to increase accountability to parents and strengthen management and performance. A natural consequence, the report contended, would be “a fall in the number of teaching assistants, since the value of the rapid growth in their numbers is not supported by the research evidence”. But their conclusions were based on some very narrow and selective data negating them. With primary schools spending £2.8 billion on Teaching Assistants and support staff in 2010/11, and secondary schools spending £1.6 billion during the same period, it is perhaps unsurprising that their role and worth have found their way into the public spotlight. The Institute for Education’s Deployment and Impact of Support Staff project, for instance, suggested a negative relationship between the amount of Teaching Assistant support and academic progress in students, while Reform indicated that £1.7 billion could be saved each year through reducing costs associated with Teaching Assistants. These questions, however, are very much the result of a Government whose focus is squarely aimed on resource allocation and productivity per pound spent rather than on the actual educational outcomes and opportunities that this spending yields. Or, to put it another way, an ideologically driven attentiveness to cost at the expense of value. An example of the selective use of data is the Teaching and Learning Toolkit produced by a collaboration of the Education Endowment Foundation and the Sutton Trust. While it is true that the toolkit suggests that Teaching Assistants have a low impact for a high cost, it is important that the toolkit also specifies that this judgment is “based on limited evidence”. The implication, of course, being that the sentiment should not necessarily be taken at face value, or at least not without the addition of substantial caveats. Indeed, the Education Endowment Foundation made it clear that such a simplistic reading of their evidence is decidedly unhelpful, with the toolkit also specifying that Teaching Assistants “can have a positive impact on academic achievement”. Unsurprisingly, this assessment was not given equal weighting by Reform in their report, which appears to have been aimed at generating scaremongering headlines rather than addressing the real issues affecting Teaching Assistants. And the Government’s indifference to support staff has only added to the anxiety. While the last Labour government legislated for a School Support Staff Negotiating Body, this body was abolished within the first year of the Coalition as quangos were indiscriminately eliminated in a brutal cost-cutting drive. Similarly, the Government has axed national funding for Higher Level Teaching Assistant training and has archived all the national Teaching Assistant and Higher Level Teaching Assistant training resources and guidance, with high-quality training for Teaching Assistants becoming just another victim of the Coalition Government’s austerity package. Fortunately, with school leaders having responsibility for employing support staff rather than the Department for Education, more Teaching Assistants have been sought rather than less, despite the negative agenda of the Government. The 5.7% increase between 2011-12 reflects the 95% of school leaders who say that Teaching Assistants add real value in schools. And in case there was any doubt, Ofsted, who routinely report on the positive impact of Teaching Assistants despite not having an official remit of inspection for support staff, have looked upon their role very favourably. But with schools set to receive additional funding to better support disadvantaged students, it is high time that the Government clarified its strategy on Teaching Assistants – not only how they are to be funded, but also guidance on how they are to be trained and qualified to ensure that their contributions have the maximum impact on the education of those young people they help. At the same time, school leaders also need to be clear about the role and purpose they see Teaching Assistants fulfilling in their schools, defining the contributions they will make to learning. And this means initiating specific opportunities for teachers to liaise with Teaching Assistants in advance of lessons, not only so they know what will be taught, but so that they are clear on what tasks will be undertaken and their specific responsibilities, as well as the expectations that the teacher has of pupils. As with teachers, it is precisely this environment of openness and collaboration that we must foster if we are to raise standards and rival the best education systems in the world. And, again similar to teachers, one key measure in doing this is to promote continuous professional development that will ensure their knowledge and skills remain at the fore. It is this level of training and development that will allow Teaching Assistants to properly deliver specific, high-quality teaching interventions that will be to the advantage of teachers and pupils alike, whether it be in the shape of specialist support for pupils with special needs, administrative support to teachers to ease the pressure, or targeted interventions in other areas of learning. The latest research from the Education Endowment Foundation confirms that well-trained Teaching Assistants can make a real difference, demonstrating the significant positive effects they can have in literacy and numeracy “when they are deployed well”. And this is the crucial point – Teaching Assistants, when properly instructed and deployed, “can be effective at improving attainment”. Properly utilised, Teaching Assistants are neither low-cost substitute teachers, nor high-cost babysitters. Rather, when deployed effectively, the reality is that they add significant value to our education system and improve the learning and support that our young people are able to access. It is only right that we recognise this. Nasen Live 2014 will be held at the Reebok Stadium in Bolton on 21 – 22 May. Nasen (National Association for Special Educational Needs) is a unique event dedicated to sharing best education practice and the latest education developments. Register for free and book onto various event seminars. In the last year, Teaching Personnel has been working in partnership with nasen on a number of projects and, for the first time, will have a stand at nasen Live this year. They look forward to providing you with CPD opportunities that will better equip you to deliver even greater value to pupils with special educational needs, should this be an area of education where you are seeking or would consider pursuing work opportunities. In recent years, Teaching Personnel has positioned itself as the leading recruitment agency for the special needs sector, with staffing roles to support pupils with SEN representing just over 40% of their total candidate placements. Several specialist SEN branches were opened recently and highly trained special needs recruitment consultants now operate in every branch across England and Wales. 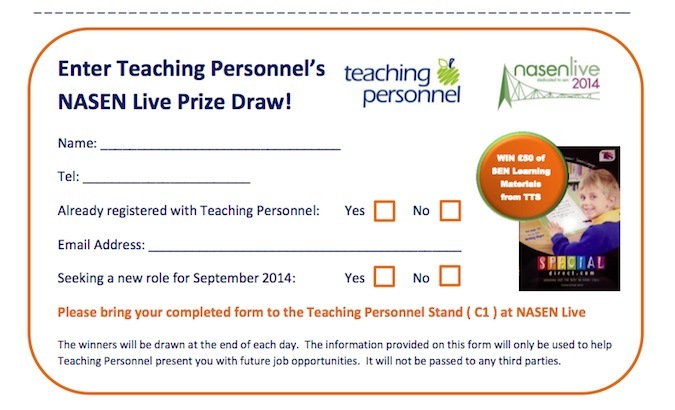 Teaching Personnel will be at stand C1 at nasen Live 2014 and will be holding a prize draw each day. So, for your chance to win £50 worth of SEN learning materials from TTS, print and complete the form below and hand it in to Teaching Personnel at stand C1.